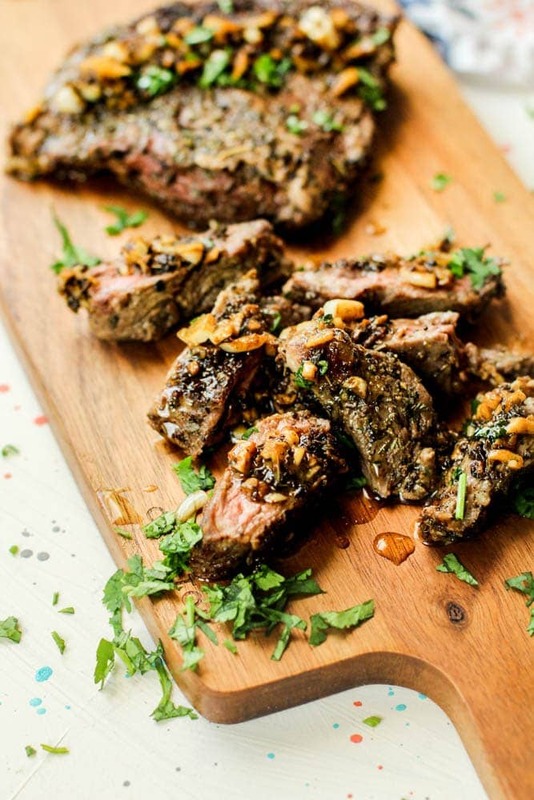 The perfect garlic butter steak is marinated with loads of garlic and lime juice -just ask any Cuban! 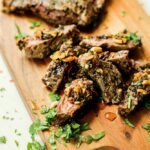 This Cuban garlic butter steak recipe is tender, juicy, and perfectly made in a matter of minutes! 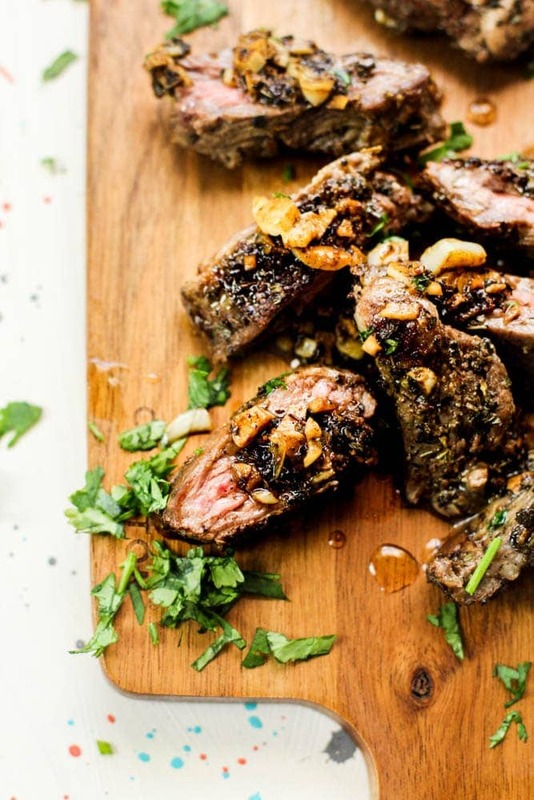 What kind of meat is used for Cuban garlic butter steak recipes? Growing up, I never had a fat juicy steak. Cubans traditionally cut their bistec aka steak paper thin, and it is DELICIOUS. But sometimes, (like right now) a fat juicy buttery steak calls my name. If you want a more authentic (and faster cooking time) Cuban garlic and lime steak recipe, choose to have the butcher cut it into thin slices. If you decide to go with the thin slices and if there is any leftovers, they’re perfect to make steak sandwiches! If you have a pion (mortar and pestel), I’d advise you to go ahead and make a paste with the garlic, a splash of olive oil, and the spices. I swear, I feel like I’m in my parents house right now! Take the paste and dress the steak. Go ahead and massage it all in. Let the steak absorb the garlic mixture for a few minutes. 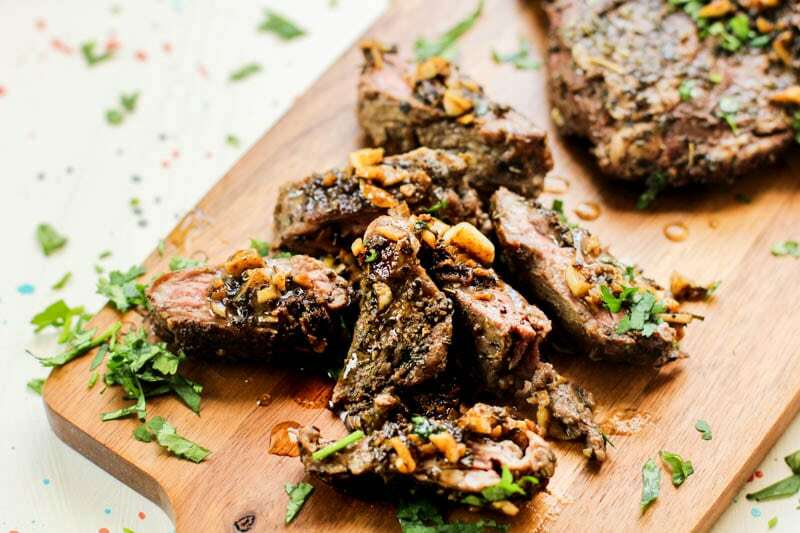 Now, take a large pan, over medium high heat add olive oil and melt good quality butter for this yummy garlic butter steak recipe. Next, cook steak for 2-4 minutes per side (less time for rare, more time for well-cooked). 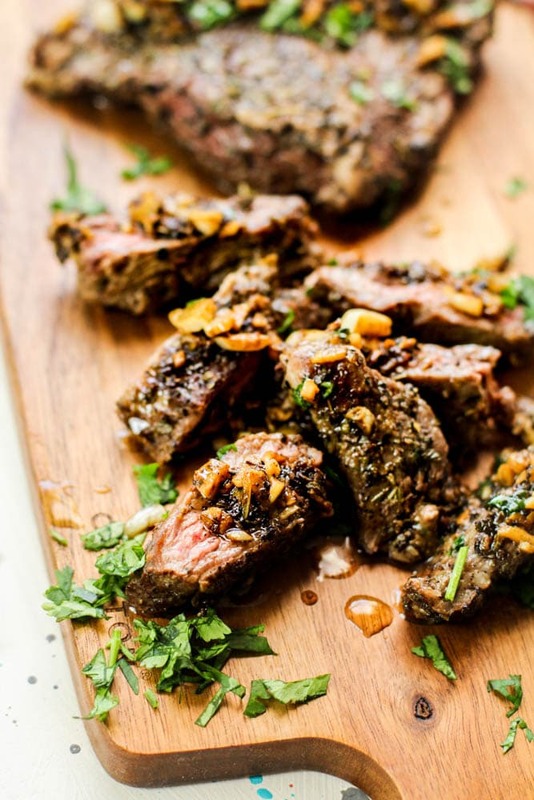 Now you’re ready to enjoy this amazing garlic butter steak recipe for dinner tonight! Enjoy the authentic Cuban flavors in this juicy steak recipe! Season steak with salt, pepper, cumin, bay leaf, oregano, paprika, lime juice, garlic and salt and pepper. Set to the side and let marinate for 10-15 minutes. In a large cast iron pan, heat oil and butter over medium high heat. Add steak, cook 3-4 minutes per side (or until your level of done). Remove steak once cooked to rest. Garnish with additional lime juice (if desired) and cilantro. NOTE: If your steak is not tender, use a meat mallet to make it more tender.